The surviving 10 whales rescued from yesterday’s mass stranding have disappeared out to sea, raising the hopes of hundreds of volunteers in the South-West that their efforts haven’t been in vain. While 11 long-finned pilot whales were successfully trucked 20km south from the stranding site at Hamlin Bay to the deeper water Flinders Bay, one struggled to breathe in the open water, prompting rescuers to bring it back to shore over fears it would lead the pod back into the beach. Vets and officials from the Deaprtment of Conservation and Environment made the tough call to put down the female adult just after 5pm, after it was discovered to be barely breathing. A calf, whose mother may have died in the stranding in which 72 whales and one dolphin have died, was abandoned by the main pod. Rescuers put the young male, which has been nicknamed Buddy, in a sling and took it by boat to join the other whales, which have now disappeared from sight. A spotter plane will take to the skies tomorrow morning to track the whales’ progress. Rescuers and volunteers on canoes, jet skis and boats spent the afternoon trying to stop the whales from beaching themselves again. 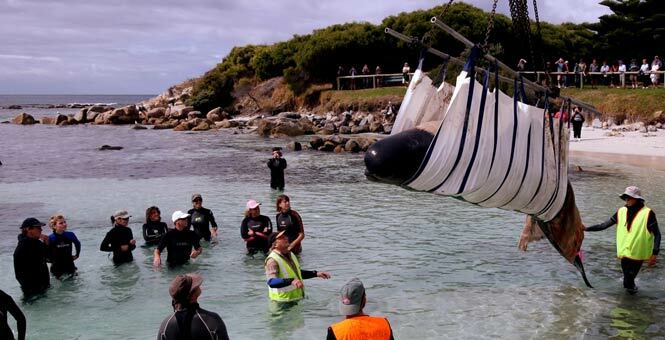 Many rescuers are still involved in the clean-up operation, removing the dead whale carcases from Hamlin Bay. Volunteers have been thanked for their tireless efforts throughout the two-day rescue operation. Yesterday 250 volunteers and 100 DEC staff took part in the beach operation, with 186 volunteers and 80 DEC staff involved today. Local community groups, council staff, police and ambulance workers were also involved. The massive rescue operation started early this morning with the transportation of the surviving whales from Hamelin Bay to the deeper and calmer waters of Flinders Bay. Earthmoving equipment was used to move the whales from the beach to firmer ground, where they were lifted by cranes into waiting trucks. 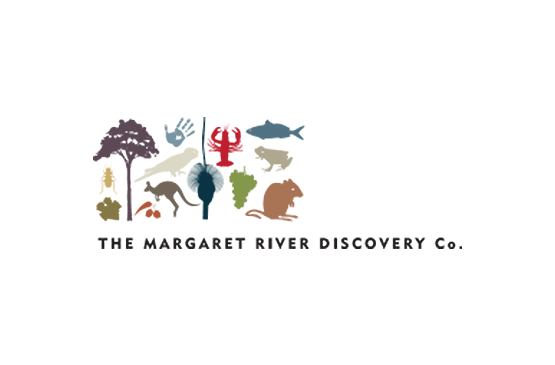 They were then driven 15km to Flinders Bay, with volunteers helping to keep the mammals calm and cool with a steady stream of sea water. At Flinders Bay the creatures, which measure up to six metres and weigh up to 3.5 tonnes, were put into the water using cranes and kept together as a group before they were released and herded out to sea. 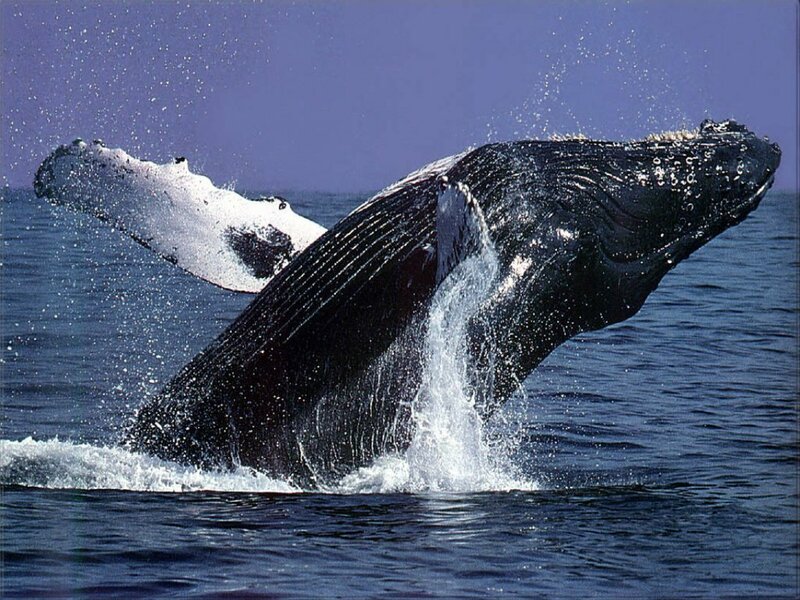 If the animals were not returned to the sea together, they were considered likely to beach again on hearing the distress calls of stranded whales. Beaches from Hamelin Bay to Boranup will remain closed until further notice because of fears that sharks were being attracted by the whale and dolphin carcasses. Nine dead long-finned pilot whales washed up on the shore this morning, some of which had been injured by shark bites, and the Department of Environment and Conservation said it had “significant concerns” about the risk of attacks. “We have got nobody in the water in Hamelin Bay as a precaution,” Mr Foster said. Mr Foster said that 60 volunteers nursed the whales throughout the night by pouring water on them and ensuring their blowholes stayed open. The temperature dipped to 5C because of the wind chill. Rescuers were told to not wander beyond knee-deep water as they retrieve buckets of water to pour over the beached whales amid concerns over the sharks. Roads to Hamelin and Flinders bays were closed to allow for the passage of the rescue trucks, but hundreds gathered at Flinders Bay to watch the effort. Many of the dead whales have been buried at a nearby waste disposal site and more will be removed and buried tomorrow. Carcasses washed up at inaccessible and more remote parts of the coastline will have to be buried on the beach. “DEC staff and volunteers showed great perseverance and team work in ensuring these whales have the best possible chance of survival,” DEC operations officer John Carter said. Local vets and students from a nearby high school also assisted in the overnight operation. The overland technique has been used in the past, but not for long-finned pilot whales in WA. Vets, scientists and DEC staff measured the carcasses of the dead whales and dolphins and took DNA samples to allow scientists to assess the genetic information and population structure of the pod. False killer whales have successfully been released at Flinders Bay in the past, once in 1986 and again in 1988, but the technique has not been used for long-finned pilot whales in WA, according to the DEC.